It brings me great excitement to welcome the official Launch Week of Jay D's Louisiana Barbecue Sauce. I'm sure that most of you have already heard about the sauce and the launch week, but just in case you haven't, here's a quick rundown. 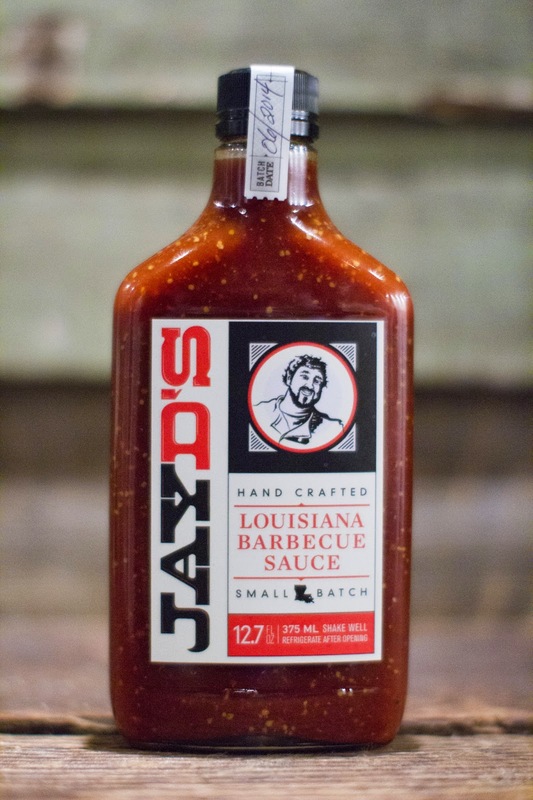 Jay D's Louisiana Barbecue Sauce has been a little over two years in the making. I started playing with recipes shortly after quitting my day job and taking on Bite and Booze full time. Then I got busier than I ever expected with the blog, radio show, video stuff, and everything else. It was a good thing, but the barbecue sauce went to the backburner along with the book deal with the LSU Press (I still have full intentions of writing it soon, though!). It took a while, but Jay D's Louisiana Barbecue Sauce is now officially here. You can find more details about the sauce at http://www.hugjayd.com. The site needs a little polishing, but you'll get the jist. This week we're rolling out the sauce in style. Deliveries have been made to Calandro's Supermarket (both locations), the Red Stick Spice Company, Indie Plate, and Ambrosia Bakery. Restaurants using the sauce include Frankie's Dawg House, Leroy's, Mason's Grill, Brew Ha Ha, Ambrosia, and now both locations of Portico. If anybody has a store or restaurant and you want some, please just let me know. For more details you can check out the Facebook event, the blog post about it, or listen to the following episode of the Bite and Booze Radio Show which was recently recorded and has aired on Talk 107.3 FM. It has now hit the podcast for your listening pleasure. I speak with Anne from Red Stick Spice, Blaise from Calandro's, Derek from Frankie's, and Blair from Bite and Booze about launch week! The Bite and Booze Radio Show presented by Calandro's Supermarket airs on Saturdays at 5 PM and replays Sundays at 8 PM on Talk 107.3 FM in Baton Rouge. The show is hosted by Jay Ducote and won a Taste Award in January 2014 as the best food or drink based radio broadcast in the country. The producer of the show is Chris Courtney at Guaranty Broadcasting and the field producer is Charles Pierce from the Me and My Big Mouth Show. It is also available on iTunes. The show's sponsors include Calandro's Supermarket, Jay D's Louisiana Barbecue Sauce, Visit Baton Rouge, Portico Restaurant and Bar, Lock & Key Whiskey Bar, Slap Ya Mama Cajun Seasoning, Mason's Grill, Donner-Peltier Distillers (Rougaroux Rums and Oryza Vodka and Gin), Louisiana Cookin' Magazine, Juban's Restaurant, the Tin Roof Brewing Company, the Louisiana Culinary Institute and Triumph Kitchen.